Although founded specifically for wild birds the Hospital also cares for small mammals. Most of the small mammals treated at Gower Bird Hospital are hedgehogs. They arrive suffering from breathing problems caused by infections or lungworm, and skin problems such as ringworm or injuries. The injuries are often caused by strimmers or other garden tools. The hedgehog may have been run over or caught up in plastic can holders or rubber bands dropped by the postman. Every year Gower Bird Hospital receives hedgehogs which have been trapped in steep sided garden ponds. 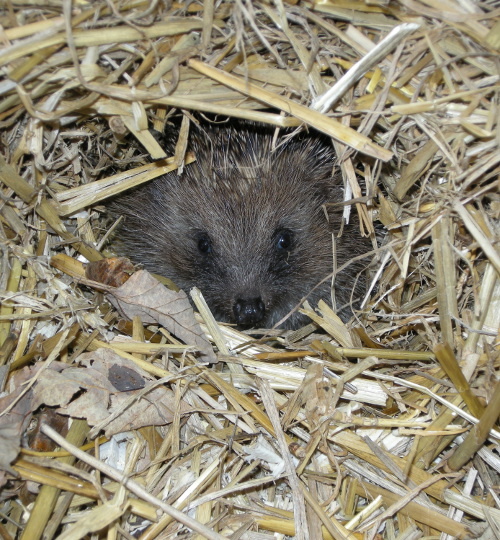 The poor hedgehog has usually been struggling to get out all night and is eventually spotted and rescued the next day. These hedgehogs arrive exhausted, very cold and with a good chance of pneumonia through inhaling the water. These accidents could be so easily avoided by providing ramps for the hedgehog to climb out or by designing the pond with natural sloping edges. Many baby hedgehogs are brought to the Hospital. Usually the nest has been disturbed and the mother has had to abandon them or has been killed on the road. The hoglets are often cold and dehydrated. The treatment unit provides essential heat pads and heat lamps and staff can administer body replacement fluids if necessary. The youngsters are then hand fed with milk substitute and toiletted until they are big enough to start eating mealworms and cat food. Toiletting is very important as a very young hedgehog does not pass urine or droppings of its own accord and must be encouraged to do so by gentle wiping with damp cotton wool  simulating the mum cleaning the baby. (Remember  never give cows milk to hedgehogs as it can cause enteritis). More than 300 hedgehogs arrive every year and the Hospital also treats other species such as bats, voles, shrews, weasels, stoats and even toads and frogs. After three or four weeks, when they have increased in weight to about 300g and can maintain their own body temperature without the heat pad, they are transferred from the treatment unit to the rehabilitation runs outside. Here they have a chance to dig in the earth and grass and start learning to find their own food. After spending a week or so in the rehab runs and when we have made sure that they are gaining weight, sleeping all day and active at night, they are ready for a soft release. The runs have a sleeping compartment and a mesh-lidded area allowing access to the natural ground. At the end of the run is a small door. 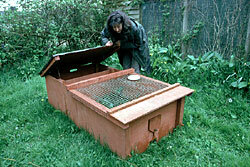 This allows the hedgehog to explore outside and return to a safe nest for the day. Food is still supplied in case they havent managed to find enough natural food. Several times, a hedgehog has continued to use the sleeping area but ignored the food. When weighed we found the hedgehog had increased in weight so was obviously feeding well in the wild but still needed the day nest. After a few days, the hedgehog doesnt return to the run at all. But where are they and are they coping in the wild? 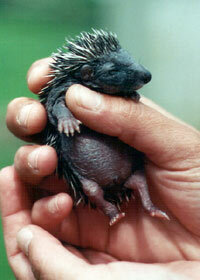 The young hedgehogs have been hand reared and have had no natural mother to show them the tricks of the trade. To answer this question Gower Bird Hospitals hedgehog radio tracking project started in 2001. A transmitter is fitted to the back of the hedgehog  like the bird tags, this will also moult off with the spines and is not permanent. After fitting the transmitter, the hedgehog is observed using infrared light and CCTV to ensure the tag is not causing any distress before release. Another student from Swansea University, Stam, then began the heroic task of following the tagged hedgehogs through the night! During August of 2001, Stam tracked four hedgehogs every night from dusk until dawn for 21 nights. Using infrared light, he was able to observe their natural behaviour without disturbing them. Before dawn every morning they would make a nest to sleep for the day. The summer day nests are not as robust as the hibernaculum built to hibernate over winter. One female youngster was followed until November when she made a very solid hibernaculum under a pampas grass plant in a garden and hibernated very successfully. Three of the four hedgehogs explored and settled into the surrounding area with appropriate caution, covering an area of about half a square mile. They foraged during the night and although they had walked three or four miles remained in much the same area, building the day nests in various places. However, one female had other ideas  on her first night of freedom, she set off and left Sandy Lane, travelled across the golf course and made a perfect day nest under a gorse bush. The next night she crossed a main road and eventually settled down for the day in a garden in the village of Southgate. On the third night she left Southgate via Hael Lane and headed into Bishopston Valley where Stam lost her signal! A day of frantic tracking still produced no signal  had she fallen off the cliffs or into the river? The next day we found her back in the middle of Southgate village sleeping contentedly in a garden in Heatherslade Close. All the hedgehogs did well and managed perfectly in the wild. They gained weight and had an excellent chance of surviving hibernation. An interesting observation was the use of nests. One hedgehog would wake in the evening, forage for a couple of hours then go to a different day nest to sleep for an hour. He then woke, fed again and chose a different nest to spend the day, clearly enjoying his freedom of choice, and demonstrating bimodal nocturnal activity!